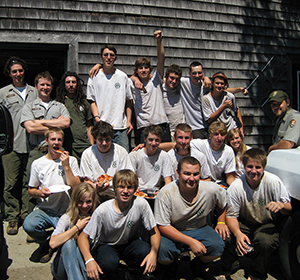 The Acadia Youth Conservation Corps (AYCC) employs 16 high school students and four Acadia National Park leaders for eight weeks each summer. FOA provides salaries and equipment and the park provides leadership and training. In 1999, the AYCC program was endowed with an anonymous gift to Friends of Acadia. For many of these teens, the AYCC is a life-changing summer job. They provide essential help to the ANP trail crew, making visible improvements to Acadia’s trails and carriage roads, reconstructing stone drainages and retaining walls, clearing vistas, cutting wood at campgrounds, and assisting wherever else needed. They experience the depths of their personal strength and perseverance, enjoy the close camaraderie of their work crew, and get to know a side of Acadia they hadn’t ever imagined. The AYCC program runs from mid-June to early August. For more information, contact Dianna McKeage, the AYCC coordinator at Acadia National Park, at dianna_mckeage@nps.gov or 207-288-8716. If you see the AYCC crew out on the trails or carriage roads of Acadia, take a moment to say “thanks!” It’s great to let these young people know that their hard work is appreciated.